Dryer Sheets - It Just Makes Scents! Garbage Can Odor Prevention: I tuck a laundry sheet under the garbage bag liner in each bathroom to keep the bathroom smelling clean for weeks! Dresser Drawer Deodorant: I love to tuck half of a dryer sheet in a knee high stocking at the back of my sock drawer. Love that dryer fresh scent each morning! Shoe Patrol: Stick half of a dryer sheet in each smelly shoe to eliminate odor overnight. Car Cleanup: Stick a dryer sheet under the driver’s side car seat to refresh your ride! It also helps cover up the spoiled milk smell from my baby’s sippy cup accidents until I can wash the car seat! Shower Door Scrubbers: If you have soap scum buildup on your glass shower door simply wet a dryer sheet and scrub the spots away. Static Clean Quick Fix: Out of static control spray? Just lightly rub a dryer sheet on the inside of dresses or skirts in a pinch for a static-free day. Toilet Paper Freshness: Roll up a dryer sheet in your toilet paper tube. Every time you spin the roll you’ll get some added freshness in your bathroom. Listless Linen Closet Control: Tuck a new dryer sheet between an old washcloth in the linen closet to spruce up your sheets. Suitcase Scents: When traveling tuck a used dryer sheet in a sock between items in your suitcase to keep your clothes smelling fresh. Camping Check: Tuck a dryer sheet inside rolled up tents and backpacks to eliminate those embedded fire odors. Tuck a used dryer sheet inside sleeping bags for a good nights sleep on your next campout. Dryer sheets are also a great bug repellant so the creepy crawlies won’t be snuggling you either! Using dryer sheets beyond the laundry room just makes “scents.” Find a smelly spot in your home or office that needs some refreshing and add some dryer sheet love today! In a large pot, cover uniform, medium-sized potatoes with cold water and add a pinch of salt. Bring to a boil. Cook over medium heat until fork tender, 20 to 30 minutes. Drain the potatoes in a heat-proof colander and then return them, in the colander, immediately to the empty pan. Cover potatoes and colander with a dry kitchen towel. Let cool for 20 minutes and serve as a side dish with butter and sour cream or peel and dice for creamy potato salad. Follow “Perfect Potatoes” recipe above or place potatoes and water in 2-quart microwaveable dish. Microwave, uncovered, on HIGH 10 minutes or until potatoes are tender. Let stand 5 minutes. Drain potatoes. Press each potato with bottom of small bowl or saucer to flatten to 1/2-inch thickness. Heat dressing in skillet on medium heat. Add potatoes; cook 4 minutes or until bottoms are golden brown. 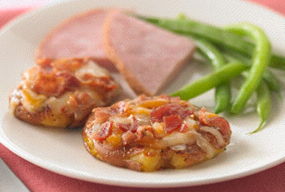 Turn potatoes over and sprinkle with cheese and bacon. Cover skillet with lid. Cook an additional 2 minutes or until cheese is melted. Seasoned Baked Potatoes ‒ Thanks Mom E! Mix dry spices in a sealable plastic bag. Lightly rub potatoes with oil and add potatoes to the bag one at a time ‒ shake bag to season. Bake at 350 on metal baking sheet for 1 hour or until tender. Bring a pot of water to a boil. Score an uncooked potato all the way around the center in a full circle with a sharp knife. Add potato to boiling water and let boil for 15 minutes. Remove from water and drop into ice water for about 10 seconds. Gently pull potato skin from either side of the scored mark. Amazingly the skin will easily pull away! No matter how you slice 'em, dice 'em, chip 'em or chop 'em, potatoes are always a great addition to the dinner table, and at a price that anyone can afford. Store managers make the final decision in taking care of customers! Walmart does honor "Preferred Shopping Card" advertised prices. Must be like items, be advertised and require a competitor's shopping card, for the discount to apply. Walmart does not honor advertisements that require a purchase in order to receive the advertised price or free product. Walmart does not honor "Buy One / Get One Free" advertisements. Walmart does not honor double or triple coupons or percent off advertisements. Walmart does not honor other retailers' "Misprinted" advertised prices. Walmart does not not honor Internet Pricing. * Wal-Mart only accepts coupons for merchandise we sell and only when presented at the time of purchase. * Coupons should have an expiration date and be presented within the valid dates. Wal-Mart will not accept expired coupons. * Internet coupons should be legible and say "Manufacturer Coupon." There should be a valid remit address for the manufacturer and a scanable bar code. * Only one coupon per item is permitted. Where can I find Target Printable Coupons? What is the Target Coupon Policy? The first 3 days after the holiday are 50% off. The next 3 days are 75% off. The next 2 days are 90%. After that it goes to salvage. Always Check Endcaps for clearance!! !